Furniture restoration is the work of returning to a state of beauty and functionality an item of furniture which has lost one or more important elements. These elements could be clarity or integrity of finish, or a structural, decorative or mechanical element.. Additionally, the intention of restoration is that the state of beauty or functionality returned to should be as much like its original state as possible. As an example of restoration, the detail of the rocking chair to the top right shows a decorative element which was missing when it came in for service. The crown section which is here seen unfinished, had been removed and was lost. This crown element would be an essential part of the late nineteenth century Eastlake design. The work of restoration would include designing, fabricating and finishing a replacement crown in a design consistent with Eastlake stylistic features present elsewhere on the chair. This is what we have done for the chair pictured here. 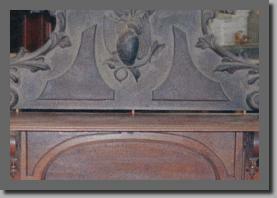 The second photograph shows a detail of a mid-nineteenth century walnut sideboard needing restoration. In this case, the most obvious need is to have the shellac finish restored. 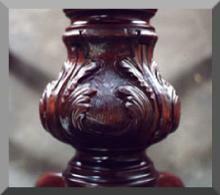 Since the shellac finish is still fundamentally intact, this original finish can be preserved and made beautiful again by techniques of careful cleaning and rejuvenation. For more information about the furniture restoration services we provide, please visit the pages linked above. 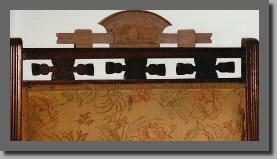 Though not restoration, we have included the work of modifying furniture for an updated use in this section. Many older pieces are brought to us with the request that they be changed in some way. For example, modifying full sized beds to accommodate queen sized mattresses, converting a cabinet originally intended for a 1960s stereo or a 1980s TV into a cabinet which can be useful today. Modifying items in these sorts of ways is illustrated in the link above.